Artificial Intelligence (AI) is “the ability of a computer or other machine to perform actions thought to require intelligence. 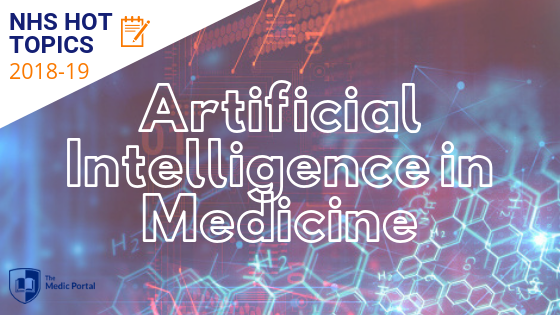 Among these actions are logical deduction and inference, creativity, the ability to make decisions based on past experience or insufficient or conflicting information, and the ability to understand spoken language.” So – how can artificial intelligence in medicine be used? AI is therefore an umbrella term for a computer being able to make decisions. The way in which ‘it’ does this, how it gathers data, interprets and produces an output, are brought about in different ways. Many systems we use today use technology supported by AI infrastructures, which often go unnoticed. Amazon’s Alexa is an example. The computer recognises spoken word and is able to respond. Yet, the (potential) uses of AI in medicine have far greater applications than this. How could Artificial Intelligence in Medicine be used? A great deal of diagnosis is about recognising patterns. For example, radiologists will look at x-ray images to spot potential disease. However, if we spotted more subtle patterns earlier, perhaps the disease could have been diagnosed at an earlier stage. This is where artificial intelligence in medicine can be useful. Computers can be programmed to read data. Using algorithms, very subtle changes can be detected, either as the precursor of a disease or before it has propagated. The benefits to the NHS were published by reform.uk in their document ‘thinking on its own: AI in the NHS’, which states: “AI could support the delivery of the NHS’s Five Year Forward View, which aims to narrow three gaps in health provision. However, it’s not as easy as it all sounds. Data collection in general is under huge. As a result, the public are wary about how their data is used, especially the levels of personal information required. The government aims to make the NHS a world-leader in healthcare innovation and recognises the importance of AI. Whilst there are significant costs of developing these systems, there are often projected savings in the long run. When we consider the current state of the NHS and the problems it faces, it seems that AI systems have come at the perfect time. How is artificial intelligence in medicine being used already? Diagnosis: AI systems are being designed to accurately diagnose disease from medical imaging scans. The potential benefits are vast. Cancers can be detected at earlier stages, offering better long-term outcomes. Virtual Nursing: Virtual nurses are robots designed to monitor health, for example from wearable devices, to offer advice and guidance to patients in their own homes, as well as remind people to take their medications on time. This could be implemented in line with the NHS 111 service, however it’s worth considering the general public opinion on talking to a robot – would the benefits of having no waiting time sway people’s view? Robotic Surgery: Robots have been developed which are able to carry out routine operations. Recent research has shown that these surgeries can have up to a five-fold reduction in surgical complications. This, partnered with the decrease in staff required and time saved, could be a promising investment for the future.